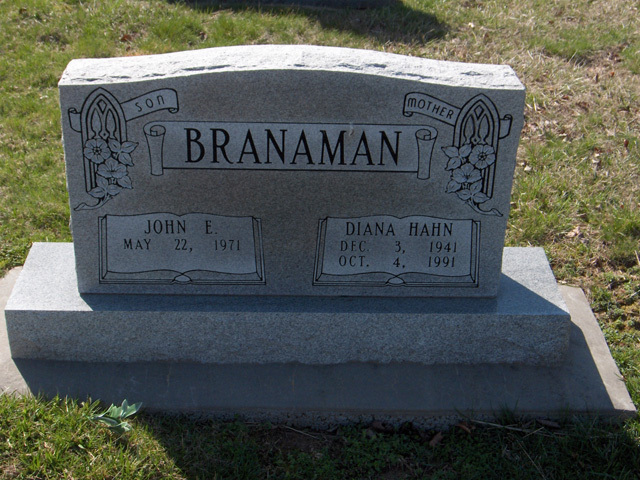 Diana Branaman of Granite City, Ill., formerly of Marble Hill died October 4, 1991 in St. Louis. She was 79. She was born near Marble Hill Dec. 3, 1941, daughter of Jess and Mattie Rhodes Hahn. She was a record clerk for Micro Film Service of St. Louis and a member of the Second Baptist Church of Granite City. Survivors are her mother and a son, John Branaman of Granite City and a brother, Joe Hahn of Reed Spring. Service was held Monday at Liley Funeral Home. Burial was in the Bollinger County Memorial Park at Marble Hill.